Some people are huge fans of Android phones, while others prefer the iPhone’s design. If you switched to an Android phone on your last update, and you’re missing the look of iOS, the good news is you won’t have to wait for a port of the GooPhone i5’s ROM. There’s a recently updated tweak in the Google Play market called Fake iPhone 5 Launcher. The launcher can be installed for free on stock Android phones. Well, they’re blunt about it. 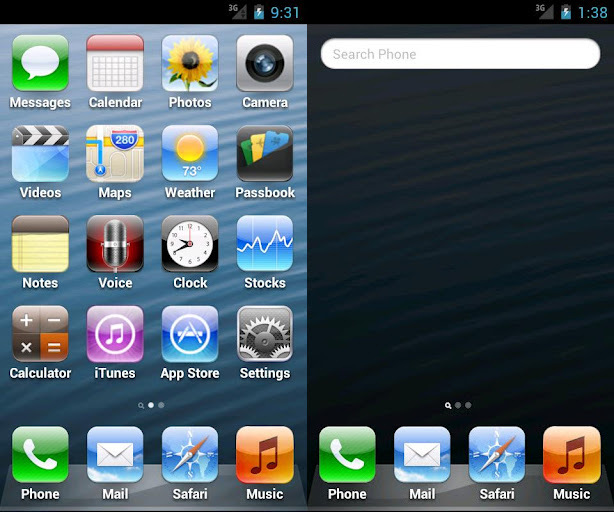 Fake iPhone 5 Launcher includes 15 icons which mimic the look of Apple’s SpringBoard. The mimicry is so faithful that it even includes a clone of the iPhone’s spotlight search. The developers recommend using the launcher on a Samsung Galaxy S II, S III, Galaxy Nexus, or a phone with a Super AMOLED+ display. For all the benefits of Fake iPhone 5 Launcher, there are a few downsides. The launcher is reported to be laggy, even on newer phones like the HTC One X; worse, its ad-supported and collects user data. Troublingly, the ads appear when an app fails to launch, if it’s not installed or if Android encounters an error. Imagine getting an error message along with an ad for Subway. To their credit, the developers openly explain that they keep track of the number of daily users, popular apps launched, and frequently used menu items. They explain why they’re using services like INTERNET_ACCESS, READ_PHONE_STATE and, WRITE_EXTERNAL_STORAGE, and that level of transparency is reassuring. But these ad analytics also means that the developers are profiting off of a blatant rip of Apple’s design. We would have a lot less trouble supporting the launcher if it was a community-made project, but as a product it makes us wary. Maybe this will slip under the radar of Apple’s lawyers, but if you want to make your Samsung Galaxy S II look even more like an iPhone, you’ll want to download the app before it’s taken down. Even includes the iPhone’s spotlight search. How well does the Fake iPhone 5 launcher run on your phone? Share your thoughts in the comments section below.